Release yourself from the shackles of the office and go mobile, with one of Eurocom’s four top notebooks. 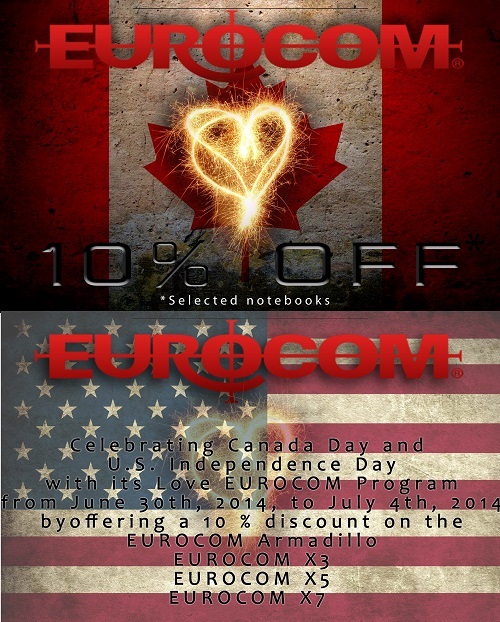 The EUROCOM Armadillo, X3, X5 and X7 upgradeable laptops will by discounted 10% starting Monday June 30th, 2014 until Friday July 4th, 2014 to celebrate the Canada Day and July 4th holidays on either side of the border. Throughout the years, Eurocom has developed an outstanding relationship with individuals and organizations across North American, and the world, and would like to keep this great relationship going during this special week with the Love Eurocom Program! Eurocom has been operating in North America for over thirty years, assisting some of the most advanced professionals in their fields with their mobile computing needs along with gamers looking for the most powerful systems on earth to business professionals looking for something practical. This experience has helped us develop some of the most innovative Notebooks, Laptops, Mobile Workstations and Mobile Servers on Earth. Recently, the EUROCOM Panther 5 Mobile Server was awarded the Intel Form Factor Solution Innovation award by outfitting a desktop replacement chassis with the highest quality and performance internal components. The EUROCOM Armadillo is a 14 inch ultrabook with multi touch screen capabilities, a 1.8GHz Intel Core i7-4500U mobile processor; up-to 16 GB of memory (DDR3-1600), Intel HD graphics 4400, and up-to 2 TB of storage spread over 2 drives (mSATA + HDD/SSD/SHDD). The EUROCOM X3 is the little brother of the “Eurocom X” line up of notebooks, but in no way is it to be overlooked, the 15.6 inch gaming notebook, built with the Intel 4th Generation Mobile, up to i7-4940MX Extreme and loaded with the best graphics cards (NVIDIA GeForce GTX 880M or AMD Radeon R9 M290X). Storage across 5 drives (2xHSS/SSD-SATA3; 2xmSATA-SATA3; and 1x HDD/SSD-via ODD), RAID 0/1/5/10 and up-to 32GB (DDR-3L 1600/1866) RAM. The EUROCOM X5 is a 17.3 inch gaming notebook the middle child in the “Eurocom X” series is not easily ignored, built with the 4th Generation Intel Mobile i7 Core procesors; up to i7-4940MX Extreme and loaded with the best graphics cards (NVIDIA GeForce GTX 880M or AMD Radeon R9 M290X) supporting both SLI and CrossFire. Storage across 5 drives (2xHSS/SSD-SATA3; 2xmSATA-SATA3; and 1x HDD/SSD-via ODD), RAID 0/1/5/10 and up-to 32GB (DDR-3L 1600/1866) RAM. The Eurocom X7 is a 17.3 inch high performance gaming notebook, the biggest and most powerful note book in the “Eurocom X” series, it is engineered around 4th Generation Intel Mobile Core i7 4xxx series; up to i7-4940MX Extreme with O/C support, then loaded with the best graphics cards (NVIDIA GeForce GTX 880M or AMD Radeon R9 M290X) supporting both SLI and CrossFire. Storage across 5 drives (2xHSS/SSD-SATA3; 2xmSATA-SATA3; and 1x HDD/SSD-via ODD), RAID 0/1/5/10 and up-to 32GB of RAM.